With ‘Twist Up the Volume Mascara’ you choose the lashes you want! There hasn’t been anything like that on the beauty market yet. With the use of only one mascara with only one want, you can choose two different effect you want to choose. ‘The twist Up the Volume’ by Bourjois will allow you to both lengthen and separate your lashes or to extremely curl them. You can choose it to be waterproof and non-water-resistant. Both comes in one, black colour. 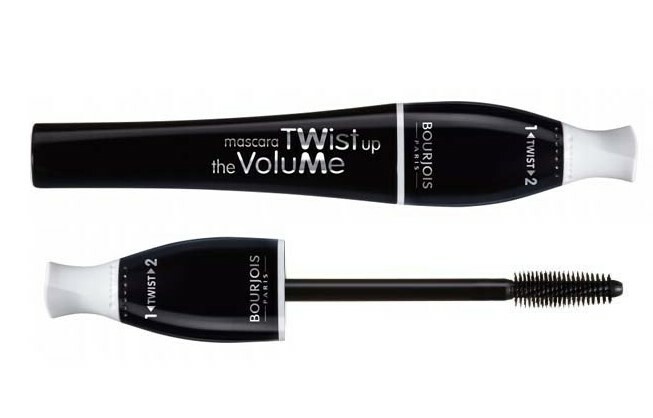 Bourjois ‘Twist Up the Volume Mascara’ has been designed to be two mascaras in one. By a simple twist of the lid you can easily change the shape of the brush. In the original position, the brush head is long and typical of a lengthening mascara wand. When you change the position by twisting the lid, the wand shortens and becomes squat with tightly packed bristles. That type of brush is standard for thickening and plumping lashes. It does both jobs amazingly well. You can make your lashes look longer and then, if you wish, with one little twist of your mascara, you make them thick and . The packaging, typical for Bourjois mascaras is in an oval shape that is easy to hold. The formula is easy to be applied and it dries quickly. It does not weights down the lashes and it feels very light throughout the day. It does not leave smudges on the bottom lid ad it often happens by the end of the day. The mascara is very long-lasting – no flaking off , no panda effect. The price is the only downside to this amazing product. ‘Twist Up the Volume Mascara’ cost over $13 depending on the store. It may be quite costly but remember; in fact, you get two different mascaras in the price of one. If you still have not found the perfect mascara or you don’t know if you prefer the lengthening effect over the thickening one, ‘Twist Up the Volume Mascara’ is for you. Give it a try and you are bound to love it, like most of the women already did. This entry was posted in Care.